The idea of a having an artwork remembering W.B. Yeats to greet anyone walking towards Bedford Park from Turnham Green Tube in Chiswick, isn’t simply to honour the great Irish and London-Irish poet, dramatist and dreamer… Having won the Nobel Prize for Literature (one of only two poets born in these islands to do so) and become a Senator in the new country he helped to dream into reality, he was highly honoured in his lifetime, and has been ever since, both through appreciation of his best-loved poems and the attention critics and academics have devoted to his life and works. The utopian community at Bedford Park made it possible for artists, actors, illustrators, engravers, painters, playwrights and poets to live inexpensively but within easy reach of London’s theatres, press, publishers and political centres. Especially relevant for someone like John Butler Yeats, following in the footsteps of the Victorian era’s great Irish painters, James Barry, William Mulready, Daniel Maclise and Martin Archer Shee, to seek his fortune as a portraitist: someone who could (just) afford Bedford Park rents and still keep in contact with his many West-End theatrical friends. While he may not have achieved the success of some of his Irish-painter precursors, the pleasure he took from the company of the Bedford Park Club’s great thinkers and talkers was such that he was determined to persuade his son, Willie, that it was better to hold on to the dream of being a poet than to sell out and take work as a hack writer. 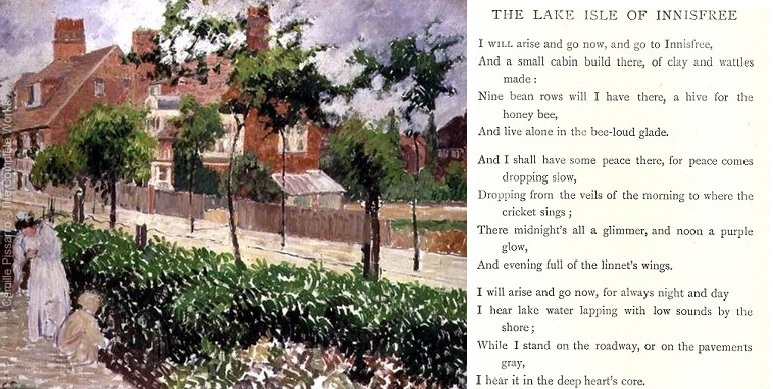 And while it was love of (and longing for) his maternal grandfather’s homeplace in Ballysodare, County Sligo, that led Yeats to write his best-loved poem of peace and longing, The Lake Isle of Innisfree , and while the poem itself contrasts London with the West of Ireland, the immediate inspiration for the poem was Chiswick Eyot, an island very like Innisfree, in the Thames at Old Chiswick, a few hundred yards from his home , as he says in his fictionalised autobiography. 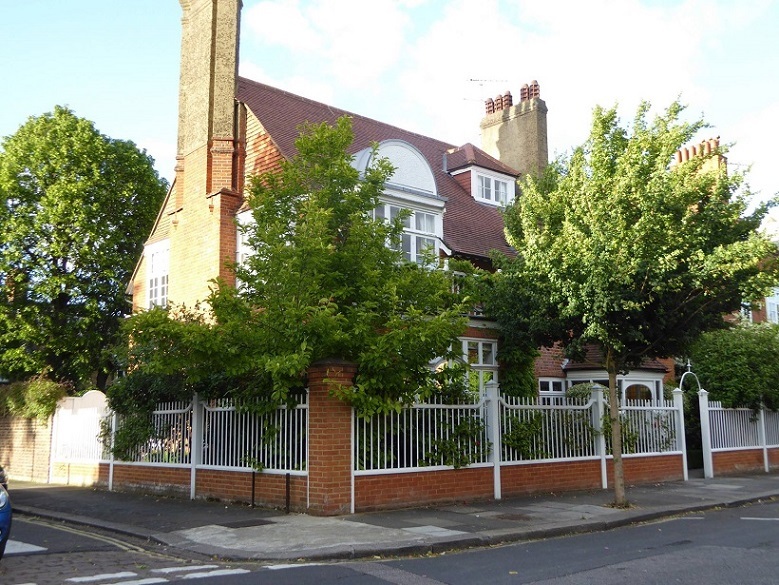 It was in Bedford Park’s Blenheim Road (below) that he wrote the poem and read a first draft to his sisters. And it was his near neighbour, poet and editor W.E. Henley (whose soirées Yeats visited on Chiswick High Road near St Peter’s Square along with the likes of J.M. Barrie, Robert Louis Stevenson and G.K. Chesterton) who first published the poem in the National Observer , making it Yeats’ first major ‘hit’. Another Chiswick neighbour, ‘craft socialism’ exponent, Wm. Morris, soon moved to Upper Mall at Hammersmith, and Yeats attended both French lessons and political debates in his coach-house along with Eleanor Marx, George Bernard Shaw, Annie Besant and Prince Kropotkin, and it was a Hammersmith friend, Shaw’s leading actress, Florence Farr, who persuaded Yeats to write his first-staged play. Permanently marking, with a suitable piece of public art, the role that Bedford Park in particular, and London in general, played in allowing a creative genius to flourish, isn’t a case of London ‘claiming’ W.B. Yeats. That public pairing of poet and place would, rather, be a way of signalling that London, like all great cosmopolitan cities, Paris, New York, Berlin, has always welcomed input from cultures other than ‘its own’ and will not only encourage young people of talent and creativity to flourish, but will allow and encourage them to retain all that is good in their ‘home’ culture and language and, if they are to be anything like Yeats, enrich, in turn, their own culture with the art they have created in those fostering cities. The complex relationships between England and Ireland have been much examined lately as peace takes hold in the North: both President Higgins and HM Queen Elizabeth II referred, during last year’s presidential visit, to Ireland’s great contribution to English life, although such comments often focus more on the Irish construction workers, nurses, doctors and teachers rather than poets, painters, playwrights and political thinkers. But we often lose sight of the vast contribution made to Irish life and culture by the Anglo-Irish, those Irish people of English descent, their families long settled in Ireland but often with one foot in London, politically, economically or artistically, many of whom chose, like W.B. Yeats and his painter brother, Jack, to champion Ireland’s culture, history and language, and the cause of Irish freedom. …and has immense significance for those who want to understand the creative process, for those who believe that the company and encouragement of fellow-artists is essential to creativity and imagination; and especially for those involved in the endless puzzle as to how architecture, design, affordable housing, and community-oriented planning contribute to the good society. The chosen site (subject to design & permissions) is directly in front of St Michael & All Angels, the unique Arts & Crafts church the Yeatses attended, just a few hundred yards from the first of the two houses they occupied in Bedford Park in the 1870s/80s/90s, and just off the roadway and pavements gray that Yeats himself trod when, in 1888, he walked home (to the second of the family’s residences) and immediately wrote of that roadway and those pavements in The Lake Isle of Inisfree , inspired by Chiswick Eyot on the Thames, 20 minutes due south: the poem was published in the National Observer by Chiswick neighbour, WE Henley, and is still one of Yeats’s best-loved poems. The artwork will be visible to Turnham Green (District Line) commuters leaving the station Yeats himself used so frequently, and faces, to the west, Bedford Park’s ‘village green’ (scene of annual fairs & festivals); to the North West, the London Buddhist Vihara which would certainly have intrigued the poet and seeker but which was, in his day, the Bedford Park Club where he first heard political debates, saw pageants staged, and first dreamt of an Irish National Theatre. To the south lies the Tabard Pub (named after Chaucer’s Tabard) with an inn-sign painted by a local Pre-Raphaelite as Yeats points out in his memoirs, and the School of Art attended by WBY’s brother Jack, Ireland’s leading 20c artist, and his sisters Lily & Lolly, followers of Wm. Morris’s craft socialism and virtual founders of the 20c Irish craft movement. Anyone interested in supporting the WB Yeats Bedford Park Project in realising the dream of having an artwork celebrating Yeats’s boyhood & youth greet visitors to Bedford Park, of marking Chiswick as a place that welcomes strangers and fosters talent, that gives something back to the wider world, and marks it as a place of pilgrimage, like Shakespeare’s Globe or Doctor Johnson’s House, for visitors interested in history, literature and culture … whether your support is individual or organisational and whether it’s likely to take the form of advice, ideas, experience, funding or practical help, or whether it’s simply to signb up for the next Land of Heart’s Desire WB Yeats Bedford Park Literary Walk, we will soon have a dedicated website with donations and contact pages created but in the meantime, do please feel free to contact me on cahal.dallat@wbyeatsbedfordpark.com. 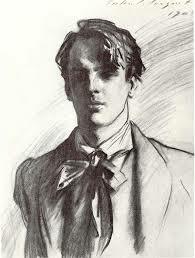 Nobel-prizewinning poet, WB Yeats, though much inspired by Irish legend, landscape and longing, spent two-thirds of his youth in London, the majority of that time in the first-ever ‘garden-suburb’, Chiswick’s Arts-&-Crafts-influenced Bedford Park, whose diverse artists’-colony of inhabitants fostered his literary talent and endeavours. Irish poet and literary critic, Cahal Dallat, has lived within a few blocks of the Yeats family’s two Bedford Park homes for all of his adult life and – fascinated by the ways in which Willie, his father, and his artistic siblings, negotiated the metropolis’s social networks, while dreaming of Sleuth Wood or Ben Bulben – has lectured on the importance to Victorian London of Irish artists (poets, painters, playwrights, composers, and politicians, for politics, too, is an art in Ireland) … and on the equal importance to often-penniless, exiled Irish geniuses, of London’s complex cultural intersections and opportunities. Yeats has always been with me as with any poet, as with anyone Irish. My Irish-speaking maternal grandfather, John Gilligan, was, like Willie Yeats’ maternal grandfather, from Ballysodare near Sligo, from the Barony of Kilmacowan where Yeats’ first-staged play, Land of Heart’s Desire is (fictionally) set. I was used to hearing my grandfather play Down by the Salley Gardens on piano and quote from The Lake Isle of Innisfree or Easter, 1916 (he’d gone to the same school as Major John McBride who married Yeats’ great unrequited love Maud Gonne and who redeemed himself in Yeats’ eyes in that moving poem). And on one of my early visits to London, returning from Paris with my then girlfriend (now my wife) the poet Anne-Marie Fyfe, we stopped off at Turnham Green to visit some Cushendall friends only to realise that the surrounding streets of Queen-Anne-style houses with their artist-studio walls hung with lutes and ‘heaven’s embroidered cloths’ were in fact Yeats’ Bedford Park. Which is partly why we ended up living a few streets from the Yeats’ Blenheim Road home. Over the years I’ve come to understand the significance of that utopian 19c artistic community in Yeats’ development and have lectured widely on both the experience of exile and the positive effects of that complex network of Bedford Park artistic influences, both here and in the US: and for many years now I’ve led an annual walk that takes us past around Chiswick locations that are part of the young W.B. Yeats’ story. Committee: Fr. 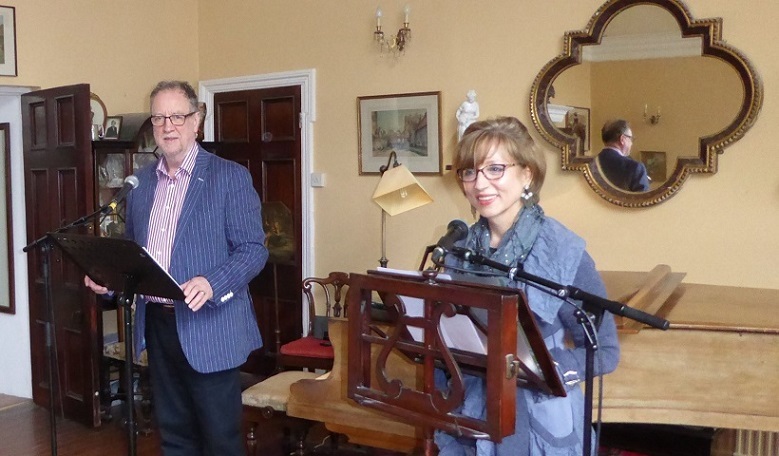 Kevin Morris (Trustee, Chair), Polly Devlin OBE (Trustee), Cahal Dallat (Trustee, Hon.Sec), Gerald McGregor (Hon. Treas. ), Matthew Fay, Torin Douglas.